I have a new video up on my youtube channel. This video is part of my Beginner Mixed Media series and it focuses on Modeling paste. I really wanted to focus on helping those who are just beginning their Mixed Media Journey. However I believe that we can all learn even from beginner ideas. I find I learn something every single time I create or I see someone else create. Below is a quick reference guide about modeling for you to print. However for an in depth understanding please watch the video above. Modeling paste is an art medium that can create a thick 3D surface on any substrate. It varies in viscosity, color and opacity, and it is made by many different companies. It is made out of gel and marble dust particles to create a thick and smooth consistency. 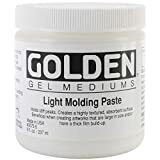 In some countries it is referred as molding or moulding paste. There’s also different spellings of the word modeling depending on what country you live in. 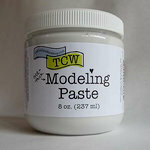 In the US its modeling paste but in Canada for example it is spelled modelling paste. All these names refer to the same art medium. 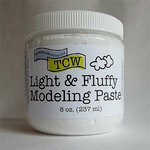 There are several brands of Modeling paste that vary in consistency, color and opacity. 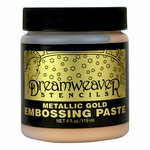 Some of the brands are: Finnabair by Prima Marketing, Golden, Liquitex, Blicks, DecoArt, The Crafters Workshop and 13 Arts. There are so many more brands and most of them are great. You just have to try and experiment to find the ones you like. My favurite ones are Finnabair by Prima Marketing as they are the ones I’ve used the most. Modeling paste has to be thick enough so it can create 3D smooth texture on a surface. When thick, it can be used to cover an object but also through a stencil. Sometimes the paste is “gel like” and sometimes its fluffy like frosting. The fluffy one is usually called light paste and it dries really quickly. 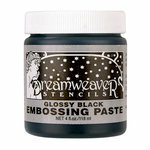 Modeling paste is usually white as it contains marble dust particles, however some companies make black paste and even clear paste which can have their own advantages when used in art. It is usually smooth, opaque and matte. There are several tips and techniques when using and applying modeling paste. Some of the most common techniques are shown below in my video such as using it to create smooth texture and 3D embossing to a substrate or an art project. 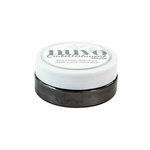 You can also mix it with other products to create different textures and colors. Most techniques are learned by experimentation and learning how the paste interacts with other art mediums. 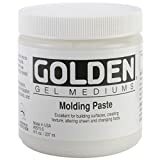 How to Use Modeling Paste? Modeling Paste can be applied in many different ways depending on the project. The easiest way is to use a palette knife or silicone brush. Here is the test guide I made on the video if you would like to print it as well. Scroll down to see the video. You can also watch a video about the most common tools for mixed media and here is the first video I created in this series which is All about Gesso. You can also check my blog HERE for printable information I covered on the “All about Gesso” video. For a quick printable reference about gel medium visit my first post or watch the video “All About Gel Medium part 1” or All about Gel medium part 2.